Driven by a dream to lead his parents' circus to success, ringmaster Tino Ponce focuses the energy of his entire family, including his four children, towards this singular goal. But his wife Yvonne is determined to make a change: exhausted and feeling exploited by her in-laws, she longs to save her children from a childhood lost to labouring in the circus that has been part of Tino's family for seven generations. 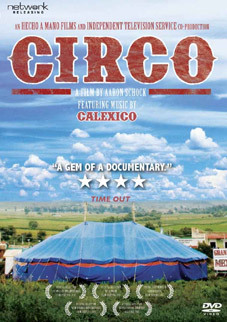 Filmed in rural Mexico, award-winning film-maker Aaron Schock's debut feature is both documentary and cinematic road movie, inviting the viewer into the luminous world of a travelling circus while examining the universal themes of family bonds, filial responsibility, and the weight of cultural inheritance. Through an intricately woven story of a marriage in trouble and a family tradition that hangs in the balance, Circo asks: to whom, and to what, should we ultimately owe our allegiances? Circo is an intimate, sympathetic portrait of a Mexican family struggling to stay together despite mounting debt, dwindling audiences, and a simmering conflict that threatens a once-vibrant family tradition. This critically acclaimed documentary featuring music from Alt American country group Calexico, will be released on UK DVD on 12th September 2011 by Network Releasing at the RRP £12.99. Update on the Ponce family.